Happy Monday, y’all! I went thrifting several days ago and found a few things that I’m planning to paint with chalkboard paint. I can’t wait to get a few projects done to show you. 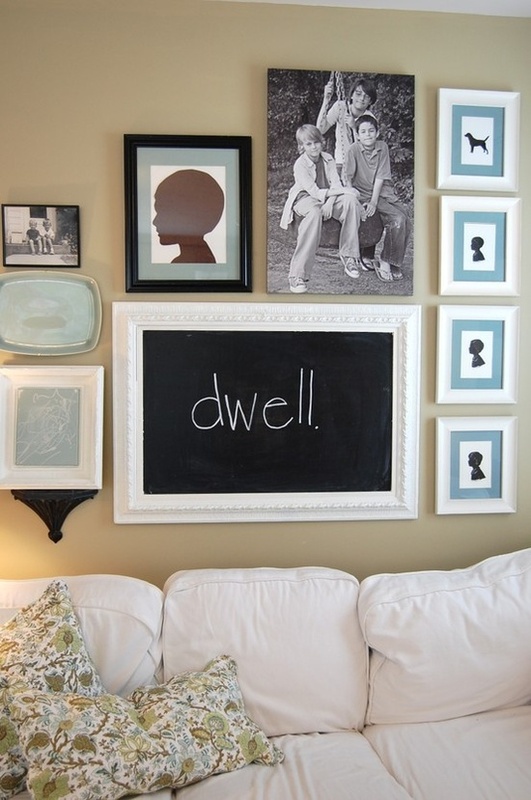 I love chalkboard paint and the multitude of ways that you can use it. 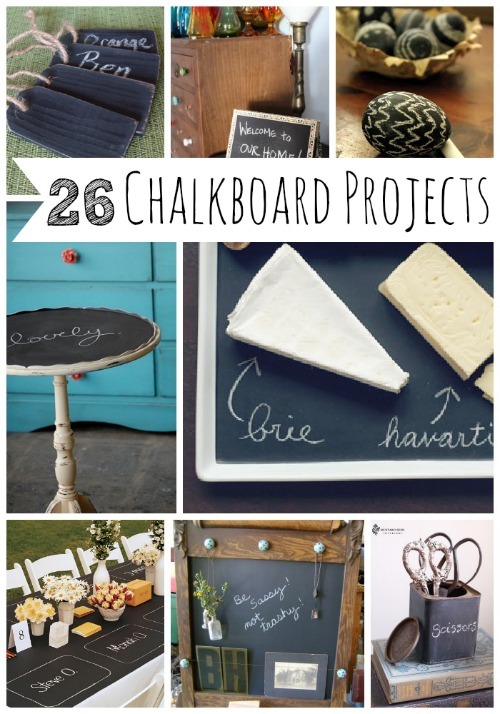 Here are some of my favorite chalkboard project ideas from around the web! 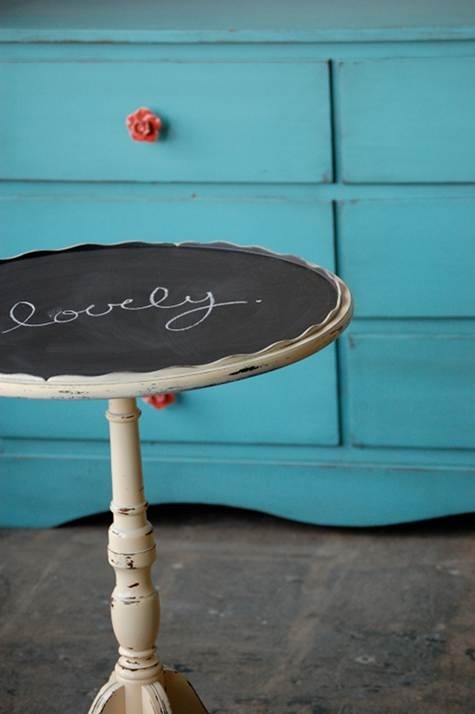 I love this beautiful chalkboard-topped table! 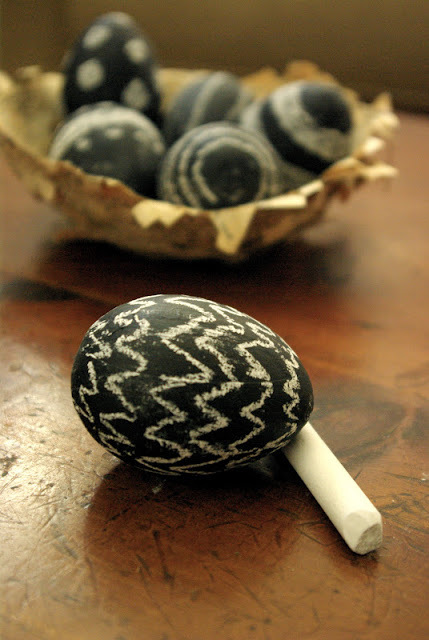 Aren’t these chalkboard eggs cute? This would be a fun project for kids! 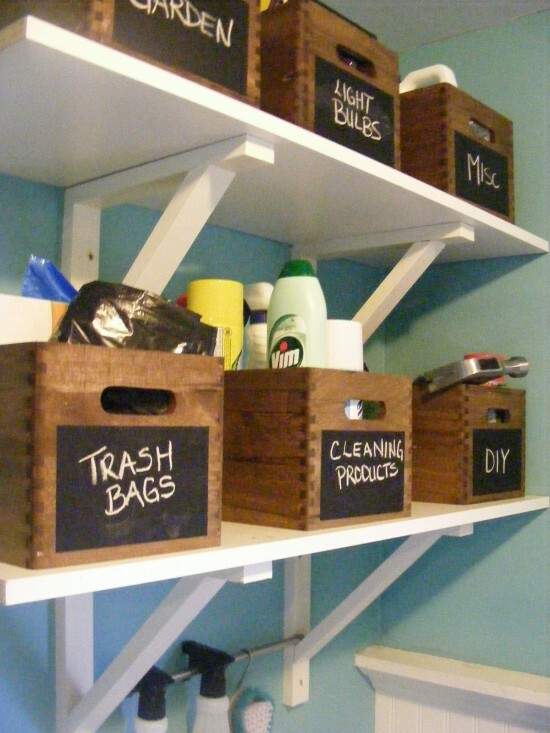 Simple and frugal chalkboard organizers! 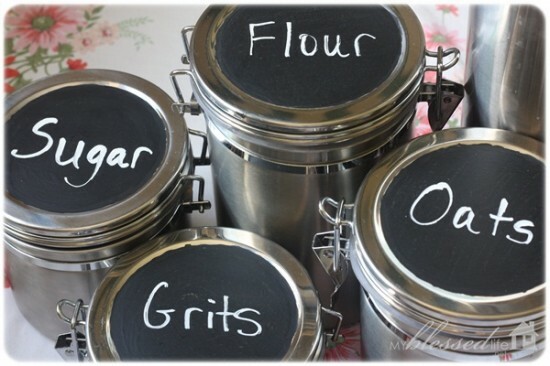 I love these chalkboard spice jar lids. The chalkboard labels on these boxes take them to the next level. So cute! 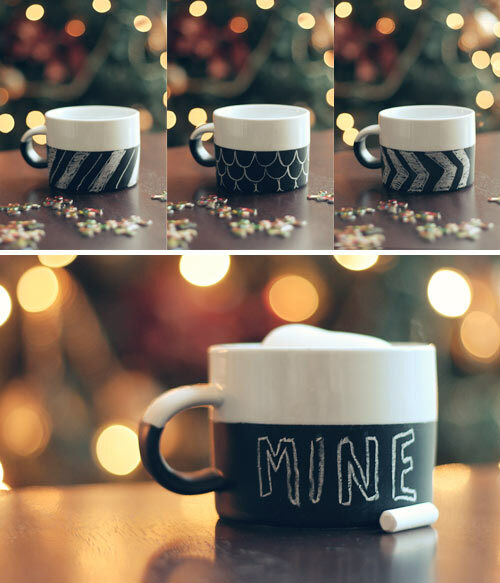 And a chalkboard mug? So very creative! I’ve always loved this chalkboard above Nester’s sofa. It’s so easy to find ugly framed art at a yard sale or thrift store! I have to help with several events this year. 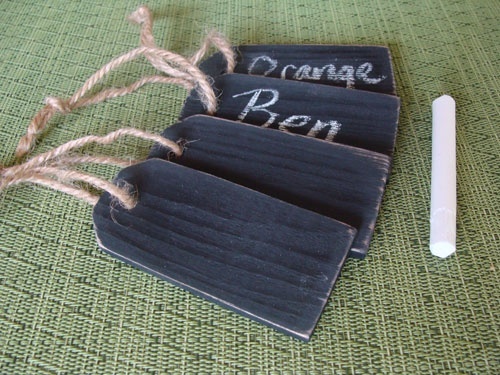 I hope to make some of these chalkboard drink labels. I always see trays like this when I’m thrifting. 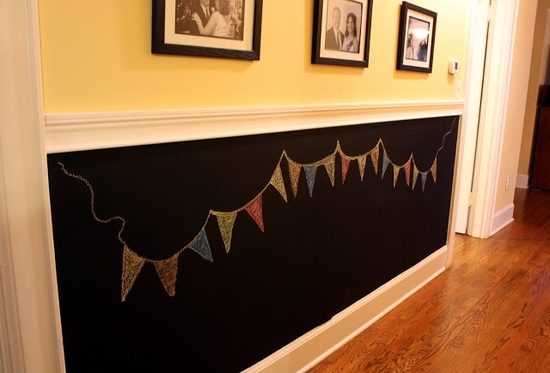 What a lovely way to fancy one up with chalkboard paint! Oh my word, y’all! 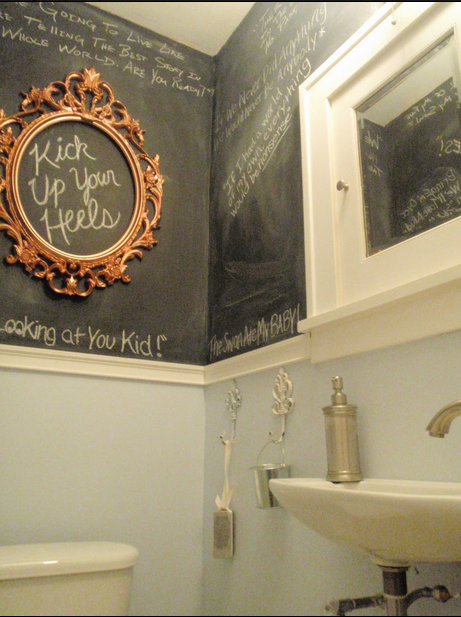 I adore this chalkboard bathroom wall…and the eraser and chalk in the little bucket. 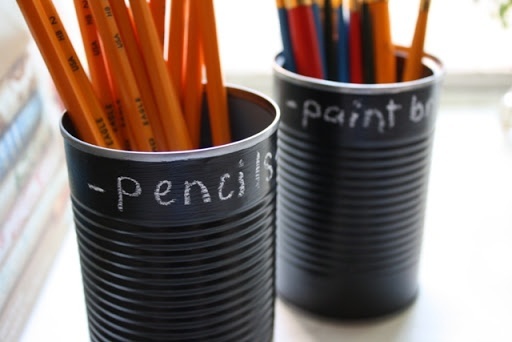 These are the chalkboard canisters that I did last year. I use them every single day. 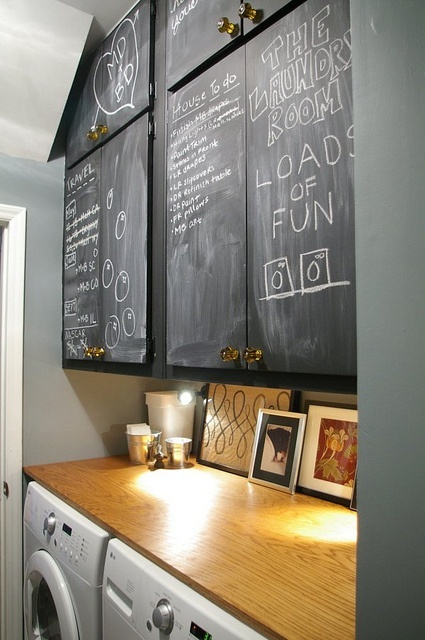 I love these chalkboard laundry room cabinets. 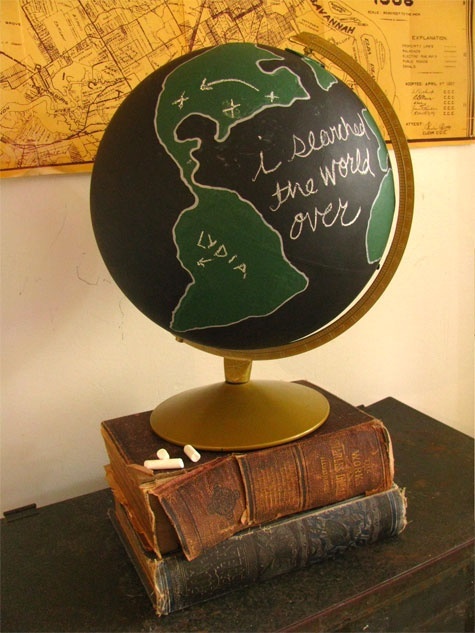 A chalkboard globe? Yes, please! 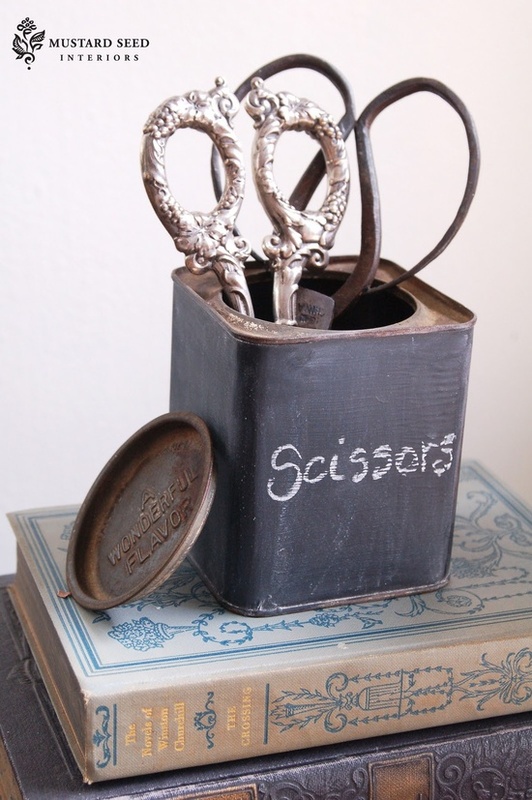 I love how Marian used an old tea tin for organizing her scissors. So fun! 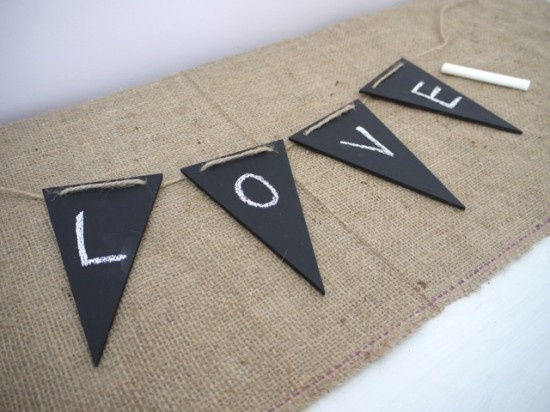 For the love of pennants and chalkboards…a pennant chalkboard banner. 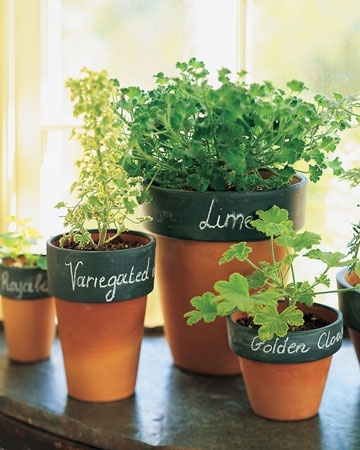 What an easy way to remember what you planted where with these chalkboard planters! 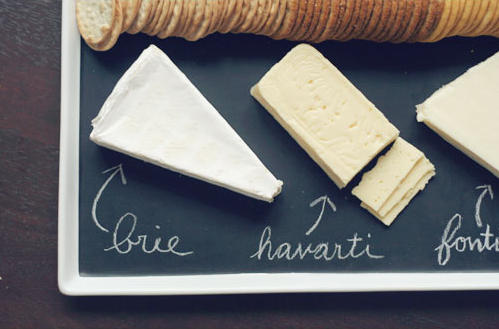 Chalkboards aren’t just for casual occasions. 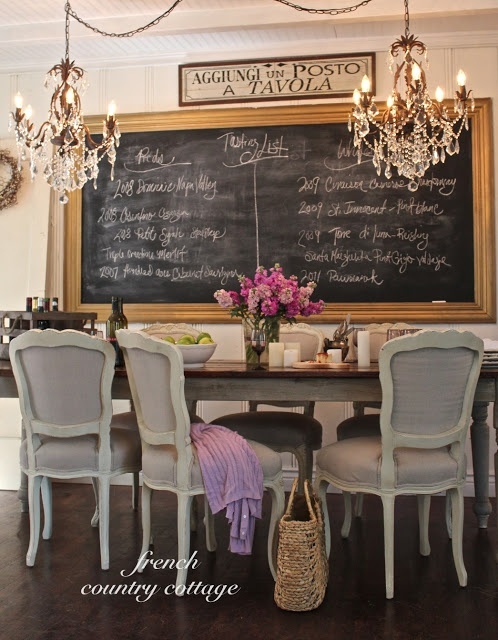 The way that this framed chalkboard is incorporated into a fancy dining room makes me smile. So pretty! 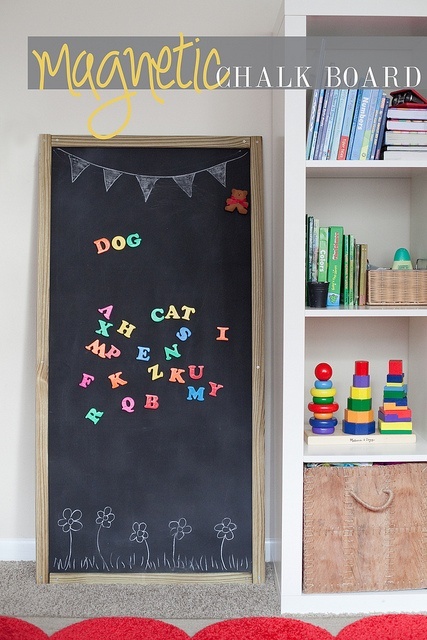 Anything can be made into a chalkboard…even this Chalkboard Drawer! 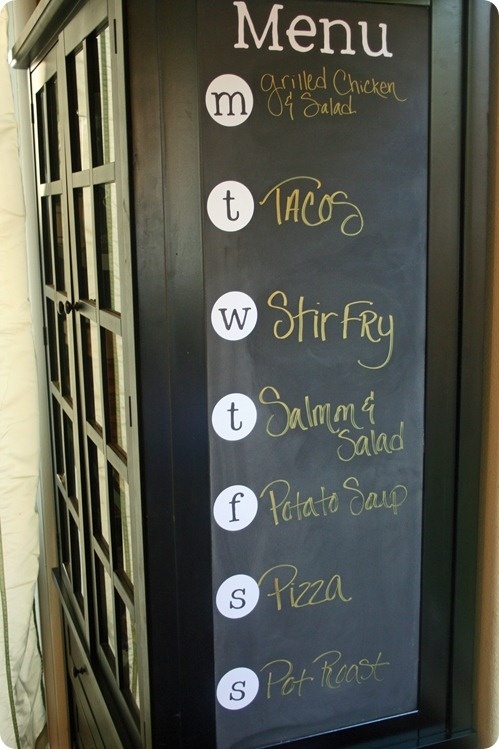 I would rock menu planning with a chalkboard menu board like this! 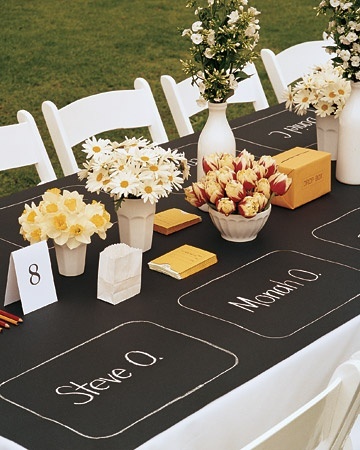 I love this concept of “chalkboard” place settings/place mats with black paper and chalk. Kids would have so much fun with this! 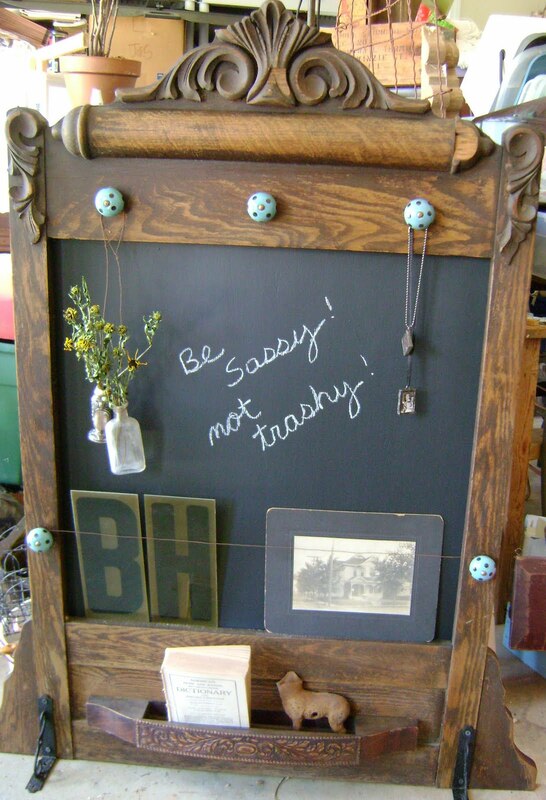 I am in love with this mirror turned chalkboard! I love old cigar boxes. The chalkboard added to the bottom of this box is so creative! 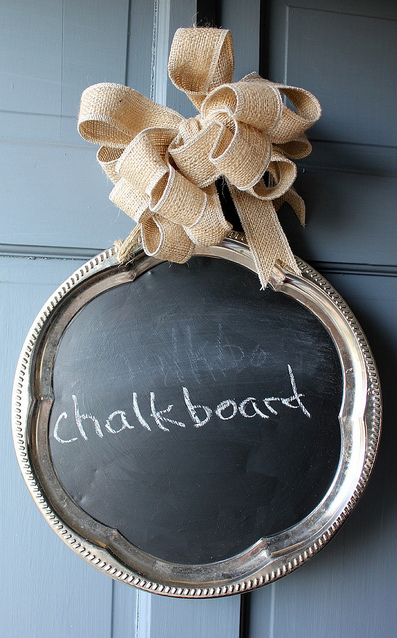 Have you ever used chalkboard paint? I would love to hear what you think!! 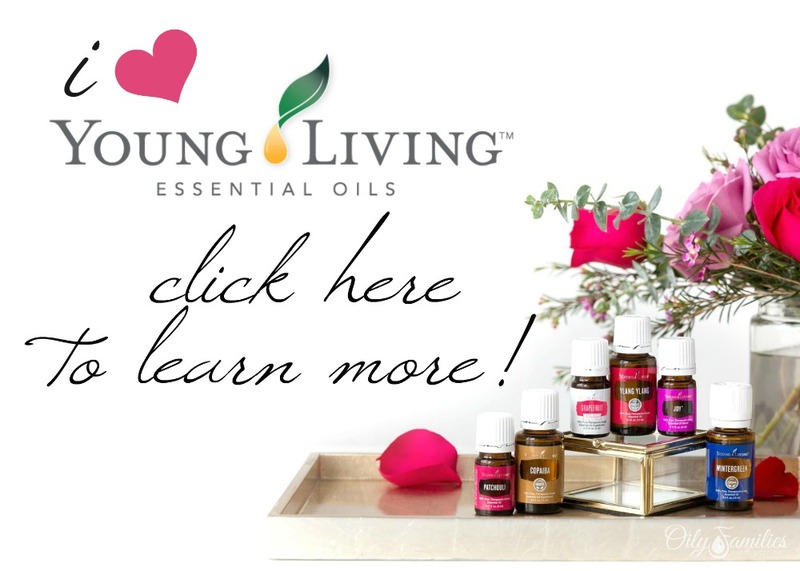 Sharing at The Frugal Girls! 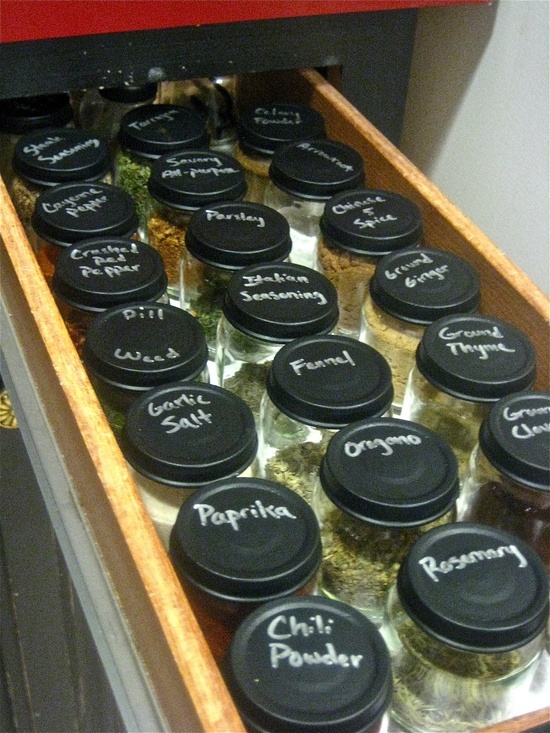 i love the spice jars and the laundry room. i’ve always wanted to do a menu board in the kitchen. I didn’t realize how much fun you can have with chalkboard paint! The cheese tray is probably my fave! It’s perfect for my Dad. He always has crazy cheeses for people to try at get togethers. 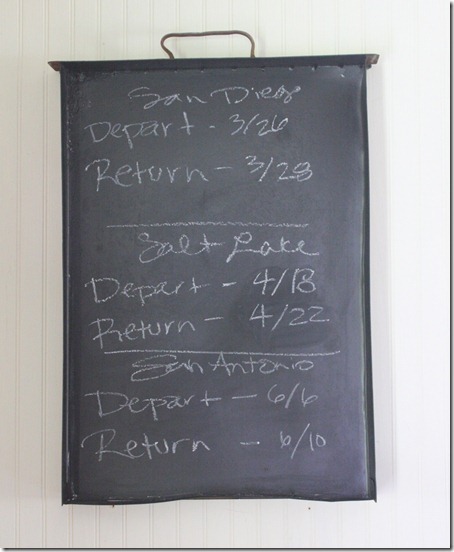 I never have used chalkboard paint…but now I think I’m going to…and soon! Thanks so much Myra for linking to my Laundry room chalkboard bins. And for all of these other inspiring ideas too! So totally fun!!!! I giggled when I saw that post!!! I copied Nester with a less-than-lovely mirror that looks MUCH better as a chalkboard! I painted it about 2 years ago. I love to change the words on it (or my kids erase them totally and place a big bulls-eye on it for Nerf practice! ), but I’ve learned that with all the erasing and writing, you sometimes need to put fresh paint on. My paint occasionally streaks off and the mirror peeks through. I love these ideas. Super fun! 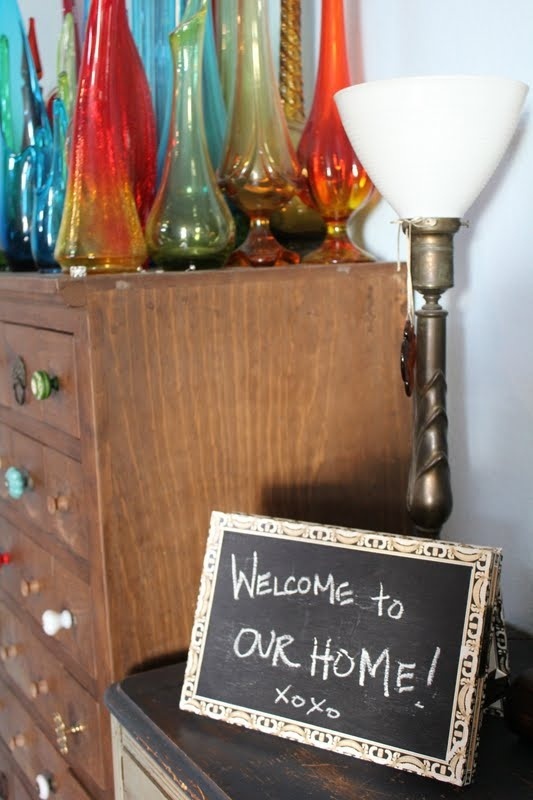 Just pinned your graphic to my chalk paint pinterest board! such fun ideas! I love the chalkboard craze! So many amazing ideas and inspiration!!! Love it! I love chalkboard paint! I just painted one of the walls in my living room with it. Not too long ago, I painted my front door with it. It has been so much fun to draw something new with each season/holiday. I like the menu board on the kitchen. It looks like you visit a restaurant or something. I bought a mobile chalkboard two years ago for my older daughter (to practice her homework) but I enshrined it after I catched my younger daughter, eating the chalks!!! Crazy ehhh? 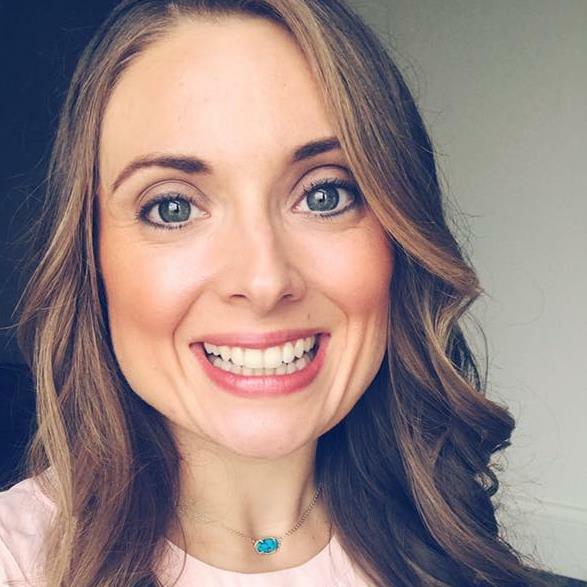 ELENI FITSAKI´s last blog post ..See How Easily You Can Save Time From Ironing! Chalkboard paint is always so fun! I use CeCe Caldwell’s Chalk Clay paints which can also be used as chalkboard paint — 3 coats, wait 24 hours and season with chalk! Lots of colors to choose from too if you are looking for something other than black chalkboard paint! 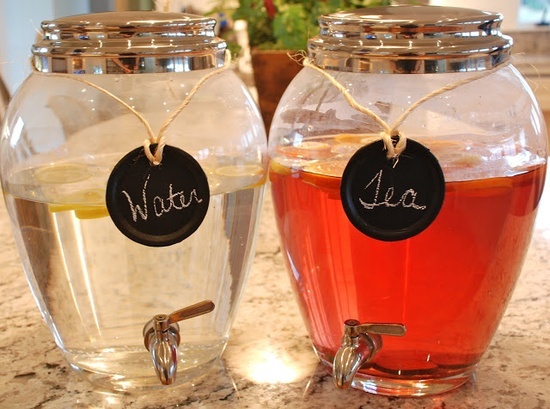 These ideas are super cute! I love the chalkboard tabs and planters! So creative! THEY WOULD ADD SO MUCH FUN. I think my second year of teaching we quit using chalk. Don’t wash your chalkboards! If you do I guess re season them. We had a giant soft type of long eraser the custodian used once a week to clean them. But yes chalkboards are fun! My daughter at 13 wrote a welcome for my class with chalk on black construction paper. I’d have it up at the beginning of school–lasted ten years!! So with your inspiration, I believe I’ll make a birthday banner for my step daughters birthday with my black paper. I too love the long narrow meal planning board but I love love the framed boards in rather formal settings! Such fun!!! I recently saw wine glasses with chalkboard paint at a tasteing room in Solvang. There was a piece of chalk tied with ribbon to the stem of each glass. I can’t wait to try some of these projects!